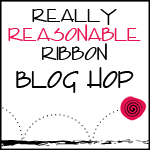 Welcome to the RRR August Blog Hop. This month the Really Reasonable Ribbon Monthly Ribbon Club Assortment is a delicious mix of pink, ivory and brown. Yummy! Why not enroll today and start with this great assortment?!! I have a couple projects to share this month. I didn’t have a lot of time so I printed up a great digital image from Ephemera Vintage Garden. You can’t beat a digi image if you don’t have time to pull out all the stamping and coloring supplies! I used Deconstructed Sketch #113 to create my card. I used the Turftan Brown Diamond Satin and Multi Dots Pink and Brown on Ivory Grosgrain to wrap around the middle of the card and I made a double bow with the same Turftan Brown Diamond Satin Ribbon to top it off. I also wrapped a Pale Pink Large Wild Rose around the center of my bow. Really Reasonable Ribbon now carries a large variety of mulberry paper flowers from Wild Orchid Crafts. I also made a couple of woven ribbon headbands with some of the printed grosgrain ribbon styles from the August assortment. This headband is a Woven Ribbon Headband with a Twist. If you missed the tutorial last month, you can find it HERE. I used the Sweetheart Cherries Grosgrain Turftan Brown from the August Assortment and added two Solid Color Grosgrain Ribbon colors in Hot Pink and Pearl Pink. Next is a Chevron Woven Ribbon Headband which uses the Multi Dots Pink and Brown on Ivory Grosgrain along with the Pink Stars on Turftan Brown Grosgrain. You can find the tutorial for this headband HERE. I like the pink and brown color scheme and those headbands are gorgeous. Love the sweet card – birds of any kind are always a favorite and the pink and brown go together beautifully! Love the colors of the ribbons! Beautiful card! I've been thinking about this color combo lately..you've inspired me to use it soon! Your bird card is absolutely beautiful! Bonnie the card and the headbands look great in these colors! Beautiful card. Wonderful digi image. The bow at the top is superb with the pink flower. Love brown & pink together. Beautiful card, Bonnie. I love the image you chose. Great use of ribbon. Thanks for sharing. Your bird card is very pretty. Cute headbands and lovely card. wow how awesome is this I love the card and the headbands are super cute. thanks for sharing. Very pretty projects–love this color combo. The card is pretty, but those headbands are wonderful. Wow!